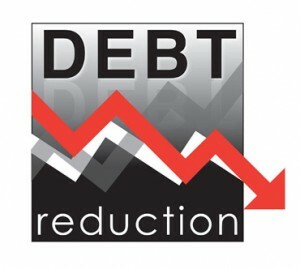 Many people want to know if it is better prioritizing debt reduction or adding to my saving for retirement? They also should add to this question of whether they have emergency savings available to deal with big financial surprises. As with most questions of this type there are several different answers depending on the situation that each consumer finds themselves in. Factors such as loan interest rates, existence of emergency savings, whether you own or rent, how long it will be before you retire and how much you have saved for retirement. We will look at each of these issues. Bottom line is that each consumer must make their own decision based on their personal situation. A little more detail about each of these major areas. Debt Interest Rates – Basically if you have a thousand dollars and you can earn 5% income by investing the money compared to your loan at 3%, then you probably should save the thousand and invest it. If the 5% income will be taxed, then it might be equivalent since taxes will take some of your income. For loans and debts carrying interest rates higher than 6% e.g. credit cards at 21%, pay off the credit cards first. Emergency savings – Everyone always needs to have money set aside for emergencies. Whether it is major repairs to your home, your car or a health issue, make sure you have 6 months of savings set aside to deal with emergencies. It could take 6 months to find another job if you lost yours. Years to retire – If you are planning to retire shortly, pay off all of your debt as quickly as possible so that you are debt free when you retire. You may work longer, however saving will be much more efficient when there is no debt. Retirement savings – Saving for retirement is incredibly important. So is paying off debt. Finding the right balance depends on how close you are to retirement, how much debt you have, the interest you are paying on this debt and what you can earn in your retirement savings plan. Generally experts advise paying off debt as quickly as possible since in most cases the interest rate is higher than any investment income you can earn after taxes are paid. Comments are welcome. For more information on this subject, click here. This entry was posted in Debt Reduction and tagged Emergency Savings on 2017/11/07 by ernie. Will your emergency fund meet your needs? What is an emergency? Do you have enough saved? Can you access it when you need it? How do you determine How much you will need to set aside to feel that your financial needs will be met if an emergency comes along? First we can discuss what an emergency fund actually is! Will Your Emergency Fund Meet Your Needs? Definition of an emergency fund: Money sitting in a savings account at a bank or credit union in accounts that are insulated from the ups and downs of the stock and bond markets. They are easily accessible online. Interest rates are pitiful on these accounts, but the emphasis is on safety over returns. In other words you can count on the money being there when you need it. It is there to help you during your emergency! Most experts suggest you should have the equivalent of 6 months salary. If you cut back on expenses to the bare minimum, and you have 6 months salary saved, it will actually last you more than 6 months. This type of emergency fund is for a job loss and will help you survive while looking for another job. Our experts also suggest you look into the details a little more before finalizing the amount. For example how long will it realistically take you to find a job? If it is longer than 6 months then you better save more! Are their major repairs or some other kind of emergency you need to plan for. Does your car need repair? What about the house? How about health issues? These are all things that an emergency fund might be able to help you with. Take a look at your life and see what emergencies you should plan for! Don’t forget to top up your fund if you need to draw on it . You want it to have sufficient funds for the next time! This entry was posted in Financial Planning and tagged Emergency Savings on 2016/05/07 by ernie. Living pay check to pay check is something that many people do all over the US and Canada, as well as around the world. We normally talk about retirement planning and getting ready for retirement, however we felt that this topic was so important that we wanted to post it here on this website. If you can get your monthly budget under control and develop some savings, you will be at far less risk of losing your home as well as being ready to retire when the time comes. Saving money around the home will make it much easier to survive a job loss and other major expenses that you have not planned for. Get your budget under control and learn to live with less money so you can prepare for the future. The results of the survey follow and it is a sobering message for many Canadians.Almost 60 per cent of Canadians live pay check to pay check and say they’d be in financial difficulty if their pay check was a week late. A new survey from the Canadian Payroll Association released Monday showed some troubling signs about Canadians’ personal finances. The 59 per cent figure is the same rate as the one found in last year’s survey. It is the second year that the agency has undertaken the payroll survey. Almost half of respondents to a national survey said they are saving five per cent or less of their income. Financial planning experts generally recommend a retirement savings rate of about 10 per cent of net pay. Also save three months’ worth of expenses in an emergency fund. Although they don’t appear to be having much success doing so, 60 per cent of respondents said they were trying to save more money than they used to. The remaining 40 per cent said they were not trying to save any money at all. “The most significant result of Canadians continuing to live pay check to pay check is its impact on their concerns about personal finances and retirement. Younger workers feel especially vulnerable. 65 per cent of respondents aged 18 to 35 saying they would find it difficult to make ends meet if they missed a single pay check. More than two thirds (69 per cent) of respondents said it would be difficult to find comparable employment with a similar salary if they lost their job. For the survey, the agency interviewed 2,766 Canadian employees across the country. The survey is considered to be accurate within 1.86 per cent, 19 times out of 20. It was taken between June of 2009 and July of 2010. In case US citizens are reading this and feel that they may be better off than Canadians, think again. You have just gone through and are beginning to come out of a major recession which Canada pretty much avoided. You need to adopt these savings approaches even more than Canadians. Jobs are more difficult to come by in the US than they are in Canada. In fact emergency savings are probably the single most important thing to think about. This is next to putting food on the table and paying for somewhere to live. Invest wisely and conservatively. If you are able to save a lot of money, diversify and avoid the get rich quick schemes. Only a few people succeed at this approach and most just end up losing their hard earned savings. Hire a competent financial manager, but always do your own research and make your own decisions. This entry was posted in Consumer Budgets and tagged Emergency Savings on 2012/01/07 by ernie. 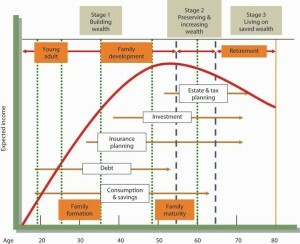 Do you know what life stage you are in financially? Many of us do not and before we know it we are walking out the door to retirement if we are lucky or getting laid off if we are unlucky. 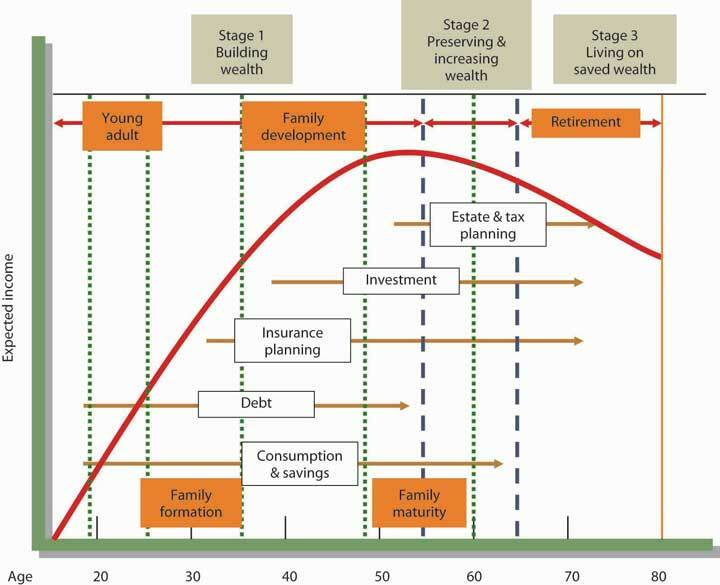 Each life stage has different requirements financially and with good planning you can prepare for each stage and come out ahead of the game so that when you are finally ready for retirement, you have sufficient funds for your retirement. The chart at the left depicts one writers view of various life stages. Most people will find that they fit into this chart at some point. You need to ask yourself where you are and are you meeting the requirements at this life stage. Pre-marriage, pre-home, pre-kids – in other words your single with no commitments and probably starting your first job. Marriage, a new home and kids – lots of expense and your single largest purchase is during this stage. Your home will be the largest investment and your kids will represent the largest expense. These can be difficult years with never enough money to go around for all the things that are needed and that you would like to provide for your family. Pre-retirement- kids are at university, you have a couple of weddings to pay for and retirement is only a few years away. Expenses are still high due to university costs and of course the weddings, however your house is paid off and you have more funds available to save and also pay your expenses. Retired – the first few years includes making that adjustment to not working or perhaps working part-time to fill the days. Many people will travel, the house is paid off, you take up golf or other sports. It is an active time and you can also enjoy the grand children. Late Retirement – Time to slow down. There are a few illnesses to deal with, some friends are no longer around, you have the grand kids and you are spending more money on medical issues. It is a complex life with lots of demands for money as different events unfold and require money to pay for them. New cars, clothing, housing, vacation, weddings, travel, repairs and it never seems to stop. On top of that there are always speed bumps along the way that jeopardize your quality of life. It might be a job change, being out of work for a while or even a medical emergency. Whatever they are, they can be dealt with proper planning and savings plans. If you are handy with a spread sheet and so inclined you can develop a financial model that will help you decide how much you need to save for every area and life stage of your life. Most people are not and need a much more simpler approach that has common sense and easy to implement. Following a few simple rules will ensure that you have sufficient funds for all of your needs. Putting them into action and sticking to them is much more difficult. It takes discipline and perseverance, but the end result will ensure that you have the quality of life that matches your income level. Adjust your savings plan if you fall behind – market adjustments, inflation etc. Many people get in over their heads as the last two years have demonstrated with all of the foreclosures and bankruptcies. Consumers losing their jobs and also taking on too much debt is a really bad combination that came together at the same time. This is really the essence of the first rule or guideline. Never take on more debt than what you can afford and make sure you have sufficient emergency savings for at least a year, not counting your retirement savings. In other words live within your means. Sure we have all heard of many people getting rich on lucky speculation in real estate or the stock market and yes this does happen. However for the majority of consumers the slow steady approach is the best approach, because for every one that gets lucky on an investment, there are a 100 who do not. The next two guidelines are also very important. Saving for retirement. The earlier you start the easier it gets and the more fund you will have for retirement. Near term emergencies will always happen throughout your life. They will vary by family. But rest assured they will occur and having a savings account equivalent to at least one years salary could mean the difference between financial ruin and time to find another job or recover from a serious illness. It is difficult to meet these savings guidelines, however you will be very thankful if you take the time and the discipline to meet these guidelines if a serious disruption in your life occurs. We will be discussing these issues and others in this blog later this year. Let us know if you have comments or other ideas about how to deal with life’s curve balls. This entry was posted in Retirement and tagged Emergency Savings on 2010/05/21 by ernie.